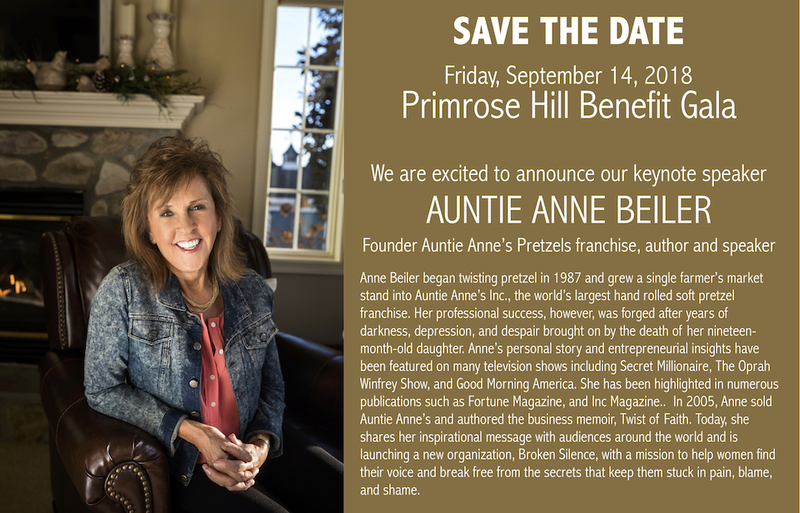 COLUMBIA, Mo 9/13/18 (PSA) -- Tomorrow night's annual fundraising gala for Primrose Hill (PH), a non-profit, faith-based counseling center, welcomes Auntie Annie -- Anne Beiler, founder of the pretzel empire that bears her name. Beiler began twisting pretzels in 1987 to support her husband’s vision of offering free counseling services in their community. What began as a single farmer’s market stand grew into Auntie Anne’s, the world’s largest hand-rolled soft pretzel franchise. Primrose Hill helps mothers and children struggling with drug and alcohol dependencies, and usually unable to pay for the cost of their care. Beiler and PH have joined forces for the Friday, Sept. 14 fundraiser at Peachtree Banquet Hall, hoping for a full house that would be "such an encouragement to our students and their families," Primrose Hill development director Rick Rowden explained. "This annual gala is to our families what a homecoming game might be for an athlete: a time when we can show our appreciation to you and you can honor the Primrose ladies for what they have accomplished." Beiler's personal journey began many years before she rolled the first pretzel, with any parent’s worst nightmare: the loss of a child. Years of darkness, depression, and despair enveloped Beiler, but out of her pain came new purpose and perseverance. Among an elite group of women who have founded national companies in America, Beiler is one of an even smaller number who have owned an international franchise company. Working Women named her one of America’s 500 Women Entrepreneurs and Inc. Magazine, Entrepreneur of the Year. Television shows such as Secret Millionaire, The Oprah Winfrey Show, Good Morning America, ANDERSON, and Food Court Wars have featured her entrepreneurial insights and personal story. Primrose Hill Adult & Teen Challenge is a home for women and children north of Columbia. Its mission, Rowden explained, is for women and children to develop a sound and stable life, spiritually, emotionally, physically, and financially. “Primrose Hill is making a difference in the lives of families coming out of addiction," Baier added. "Our annual gala is our biggest fundraiser of the year.” It will include stories from the Primrose students, silent and live auctions. Peachtree Banquet Center, 120 E Nifong, Columbia.